This new approach to the technique of contrapuntal harmonisation, as featured in Bach’s chorale harmonisations, is developed from the way in which Bach himself taught his own students the basics of compositional harmony and counterpoint. 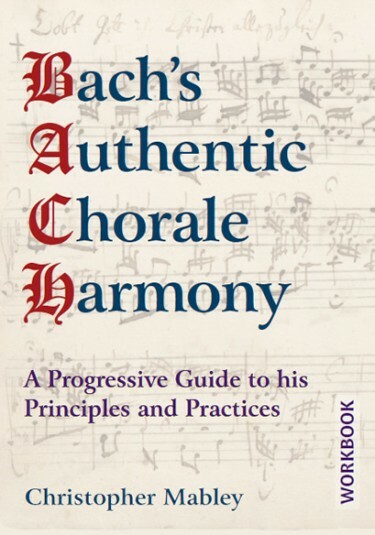 The six Worked Examples which introduce Chapters 2, 4, 5 and 6 offer insight into both the way the FIVE STEPS method works in practice and also how Bach’s own harmonisations integrate the two foundational musical dimensions of texture and harmony. Chapter 1 considers the melodic and harmonic intervals between notes, the confident understanding of which forms the basis of successful composition in any style. Chapter 2 introduces the FIVE STEPS method, provides the first three Worked Examples, and sets melodies for harmonisation closing with Perfect Cadences. Chapter 3 sets melodies for harmonisation closing with Imperfect Cadences. A concluding Coda considers further aspects of Bach’s cadential techniques. The cadential suspension is introduced – presented as two complementary forms, added-note or altered-note – and a Worked Example is supplied to illustrate each of the three common types of resulting cadential harmony. In Chapters 7 and 8, Bach’s style is rounded out with the application of suspensions of all types to all four voices. Chapter 9 introduces for the first time exercises in the harmonisation of connected melodic phrases in the manner of a complete chorale. Here the focus shifts from harmonic textures to tonal centres. Modulations to a variety of related keys are explored. For most students, this will complete their course of study. For advanced students, two extended aspects of chorale harmonisation are presented. Chapter 13 explores tonal harmonisations of modal melodies. Chapter 14 explores instrumental textures, taking the Orgel-Büchlein as its model.